Back in 2008 Panasonic released the world’s first CSC, the LUMIX G1. Six years on, the Japanese-based manufacturer has demonstrated it’s still driving the CSC market forward with its new flagship model, the GH4. Not only is it arguably the most advanced CSC on the market, but it’s the first consumer-level stills camera that can shoot 4K movies, which in a nutshell is video at 4x the resolution of Full HD. The GH4 replaces the GH3, which has proved a popular choice for both photographers and videographers and is seen by many professionals as a genuine alternative to a pro DSLR. On first impressions, the GH4 looks and feels almost identical to its predecessor, with its familiar DSLR styling and comfortable handling. But a number of improvements make the GH4 a significant upgrade. Perhaps the most important of these is the camera’s new Venus IX engine, which is exclusive to this model. The quad-core CPU caters for the extreme processing demands of 4K video, and it also facilitates improved ISO sensitivity, burst speed and image quality. At the heart of the GH4 is its 16MP Live MOS sensor, which has the same resolution as the GH3 but with slightly improved dynamic range and colour depth. While the resolution might appear fairly low compared with some other CSCs on the market, the reality is that most users won’t ever need more than 10MP for stills, or more than 8MP for video. In fact, keeping the resolution low actually means improved image quality because it allows for larger photosites. That’s important on the GH4 as the sensor is smaller than on any current pro-level camera. Another major improvement is the 3in 1036k-dot OLED screen, which boasts nearly double the resolution of the GH3. The screen comes with touch control for easy focusing and shooting (which works with gloves on), and flips out for composing from difficult angles. It is very bright and sharp, displays colour and contrast accurately, and there is no lag whatsoever. The OLED viewfinder has also enjoyed an upgrade, with an increased resolution of 2359k dots and a larger, more comfortable rubber eyecup. The quality is excellent, with sharp corners, no noticeable lag, and good colour fidelity. The GH4’s AF system is solely contrast detect, which will no doubt set alarm bells ringing for many. Contrast detect is typically slower than phase detect, though is usually more accurate. Many modern cameras such as the Sony Alpha 6000 and Fuji X-T1 use a hybrid of the two. But on using this camera any fears are dispelled in about 0.07sec. That’s how quickly the GH4 takes to focus (using certain lenses), making it the world’s second fastest focusing camera behind the Sony Alpha 6000. One of the tools Panasonic has used to achieve this is Depth From Defocus technology (DFD), which takes two images with a different depth-of-field and specific lens information to determine subject distance. One slight issue is that the camera does sometimes struggle to focus on areas of low contrast. Other notable improvements to focusing include 49-area AF, trumping the 23-area AF of the GH3, and focus peaking, which gives a visual on-screen display of in-focus areas when manual focusing. It also has Zebra Pattern functionality, where black & white stripes warn of overexposed areas. Most new CSCs have Full HD (1080p) video functionality, but until now none have had 4K video, which has around 4x the resolution. If you wish to record straight to a high-speed 4K-compatible SD card you can, but with 100MBps IPB compression and 8-bit colour space, wrapped up as an MP4 or MOV video file. For high-end video-makers who require the best quality 4K an external recorder is needed. Panasonic’s 4K Video Interface Unit will do the job, but at over £1500 it’s only likely to be within the price range of high-end video professionals. The GH4 has 22 creative filters including mono, retro and cross-process, 17 of which are available in movie mode, though there are no Scene Guide pre-sets. The camera has impressive external connections, including mic and headphone sockets for recording and monitoring high quality audio, PC sync port, and wireless connectivity in the form of NFC and Wi-Fi. Panasonic’s free Image App allows remote camera control and image review via a smartphone or tablet. Other features built into the GH4 are an HDR function, time-lapse, full weather sealing, and an electronic shutter mode that facilitates both a 40fps burst speed and a useful silent shooting mode. The GH4 comes either body only or in a kit with a 14-140mm lens, which has a full-frame focal length equivalent of 28-280mm. For a kit lens, this is a particularly impressive zoom range, enabling users to shoot sports and wildlife without buying a second lens. The 14-140mm comes with built-in POWER O.I.S. stabilisation. Image quality is excellent, with minimal chromatic aberration, even at wider apertures. There is slight blooming and corner softness wide-open, though this isn’t a major problem. There are over 20 Panasonic Four Thirds mount lenses available for this camera, as well as a range of compatible Olympus and Sigma lenses. The GH4 is very comfortable to hold, with well-labelled buttons for immediate and intuitive access to all the most important settings. There are also five customisable function buttons on the body and five more on the screen. 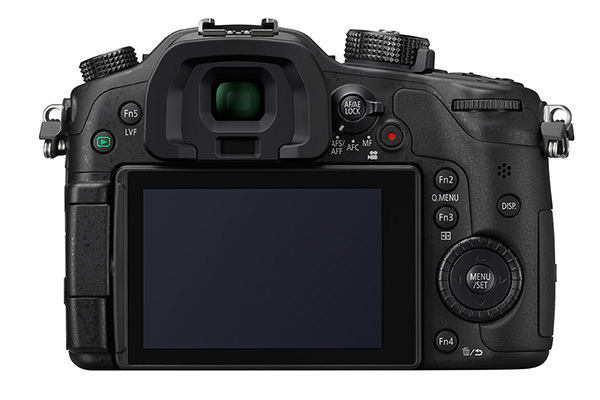 The camera is very responsive and easy to navigate, in part owing to its flip-out touchscreen and three control dials. A welcome addition is a lock switch on the mode dial so the shooting mode can’t be accidentally changed. Overall the GH4’s handling is excellent, the menu is easy to navigate, and build quality is top-notch. In both studio and real-world testing, the GH4 performed very well in low light situations, producing images with minimal noise at higher ISO settings. Up to around ISO 1600, images are fairly clean, with very little noticeable digital noise. By 3200, some noise is visible upon close inspection. Images are perfectly useable right up to ISO 6400, especially with a little noise reduction in post-processing. Noise becomes more of an issue at 12,800, and is visible even when the image is fit to screen. 25,600 is not really useable unless there is absolutely no alternative. The GH4 also has an expanded ISO setting of 100. This is useful when a very long shutter speed is needed, though at this setting, dynamic range is reduced. The GH4 has a very fast shooting speed of up to 40 JPEGs per second when using the camera’s electronic shutter, and it can maintain this speed for around 120 images with a fast enough card (maximum shooting speed not available when shooting RAW). This incredible frame burst is almost unheard of on consumer-level digital cameras, making the GH4 a very attractive option for sports and wildlife photographers. When using the camera’s mechanical shutter (in both RAW and JPEG), the camera can shoot up to 12fps with single shot focus, or 7.5fps with continuous focus, and it will do this for up 40 consecutive RAW files or up to 100 JPEGs. Without its exceptional video functionality, this CSC would have received the same four-star rating as the GH3, because as fantastic as it is, it’s fairly expensive. For a little more money you could buy a full-frame DSLR with a premium lens, which, according to DxO labs, will give you slightly better all-round image quality, and offer a shallower depth-of-field at like-for-like apertures. But with 4K and 50fps Full HD video at 200MBps, not yet available on any other current consumer-level CSC or DSLR, the GH4 is an incredible camera, boasting a stronger all-round feature-set than any other CSC on the market. Very impressive stuff from Panasonic. But don’t forget, if you’re in the market for a premium CSC, there other options out there. In particular, consider the forthcoming Sony Alpha 7S, which will also have 4K, and the Fuji X-T1, which doesn’t have 4K, but is an excellent CSC with a smaller price-tag.